Playing a major role in textile recycling industry, Fibematics has completed 50 years. Fibematics began manufacturing Scrim Reinforced Material (SRM) and converting nonwoven wiping products in Philadelphia, Pennsylvania, in 1968. Use of nonwovens keeps materials out of landfills. The company has also started wiping product conversion in southern California. Fibematics' principal location in Philadelphia operates in a Historically Underutilised Business Zone (HUBZone) and is a Small Business Administration (SBA) HUBZone employer. Currently employing 70 workers, the company has experienced steady growth in revenue in recent years, including its California location, which has been successful since the factory opened in 2014. "We repurpose an average of five million pounds of nonwovens per month," says David Bloovman, vice president of Fibematics. "Our work centres around manufacturing SRM, converting nonwoven wiping materials and trading specialised industry products." SRM is a material composed of high-wet-strength tissue laminated to polyester scrim threads, and is typically run to tight specifications for medical applications. For industrial applications, this material often begins as parent rolls of towel and tissue rejected by mills for their primary applications, and as industrial SRM. It is utilised in industries such as janitorial and sanitation as an absorbent wiping material. 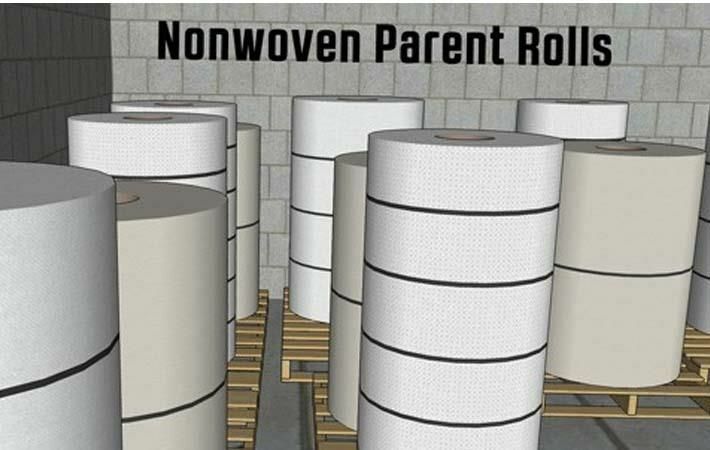 "Manufacturing SRM is one of the oldest practices in the nonwoven industry," says Bloovman. "This material remains in high demand due to its strong durability, and it continues to be an economical choice for wipers (manufactured products used to clean surfaces)." In the higher-end market, Fibematics ships virgin SRM to converters in China, where it is transformed into items such as surgeon's hand towels and disposable caps, procedural tray towels and smaller towels for medical kits. These products are then shipped back to hospitals in North America. On the lower-end, Fibematics purchases "seconds" from mills, producing "firsts" such as napkins and paper towels. This lower grade material is reinforced with SRM, resulting in a heavier-duty product, which is cut and sold as various types of wipers. Fibematics' Philadelphia headquarters has 14 machines used to convert both firsts and seconds into nonwoven wiping materials, giving these discarded textiles a useful second life and keeping waste out of landfills. The resulting products find end markets as base for new wiping products, including specialty wet wipes and dry towels. "Think of Fibematics the next time you're at a barbecue restaurant and use a wet wipe to clean up that messy sauce," Bloovman jokes. "The wipe material may have come from our factory!" Fibematics also offers private label wipes and partners with existing and startup hygiene companies, on both US coasts, helping companies select the appropriate nonwoven wiper material and sizes best for their businesses, and designing custom logos and branded packaging. The company also offers many specialised products that are highly restricted with regard to application and geographical location, selling through strategic relationships in more than 30 countries on six continents. After purchasing secondary material from mills in the United States, Fibematics processes and sells between 10 and 15 million pounds of material overseas yearly, with all materials thoroughly vetted prior to shipment. Fibematics' success, according to Bloovman, is due in part to their ability to stay ahead of the curve in industry awareness and presenting creative options to customers. For example, their trade vertical is enhanced through long-time membership with the Secondary Materials and Recycled Textiles (SMART) association, a relationship advocated by Bloovman, who recently became SMART's newest board president. "We're seeing more and more of a push towards biodegradability," he continues. "It is a big challenge to create a strong product that functions at the high-end level while making it biodegradable. Unfortunately, current biodegradable nonwovens simply don't perform as well. It is our industry's job to remain innovative and continually work towards the most environmentally friendly solution." Bloovman adds that Fibematics works hard to educate customers on the importance of nonwoven wipers and notes that studies show disposable nonwoven wipers cause less harm to the environment than the laundering of textile-based towels. From washrooms to factory floors, Fibematics' products are helping to replace traditional textile towels, rags and wipers worldwide.